Early structures in Monterey were built of sun-dried mud blocks. Walls as thick as three feet were needed to support second story floors. Adobe buildings required plastering on exterior surfaces to keep out damaging winter rains. The life of an adobe building was limited due to the lack of permanence in building materials. The arrival of the American Period brought Gallant Dickinson who, in 1847, introduced a new building technique to California, the art of fired clay brick making (Fired clay bricks were in use throughout Europe. Much of Imperial Rome had been constructed with this technique). Dickinson fired thousands of clay blocks into rock-hard bricks. 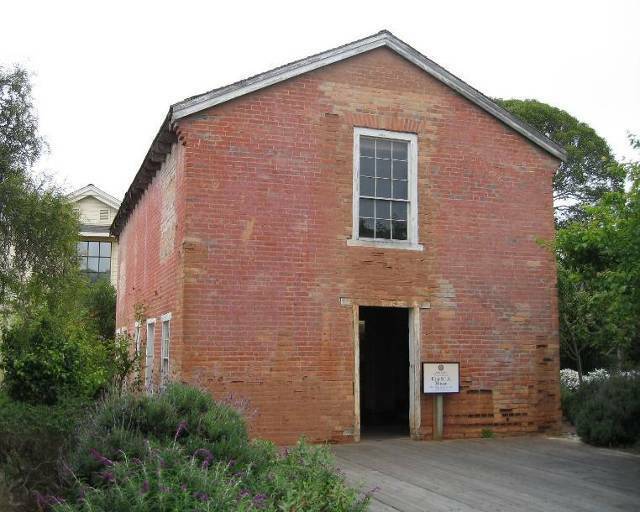 His efforts led to the construction of one of the first fired brick buildings in California. This form of brick making provided increased strength for multiple-storied buildings while maintaining standard wall widths. Fired brick was also water resistant and required little or no surface treatment. The buildings of Monterey would now be built to last. Gallant had finished the portion of the building that exists today when the call of "Gold" took him and his family to the Sierra foothills. He never finished his Monterey home. Located in the main room are displays of Monterey history. The kitchen has been restored as it looked when the building was used, in later years, as a restaurant.